The United Nations has named 17 goals that will help boost sustainable development worldwide. DigitalGlobe worked to find passionate participants who can leverage DigitalGlobe’s GBDX platform and imagery for geospatial projects supporting work in areas such as disaster response, food security, poverty elimination, and ending malaria. DigitalGlobe’s GBDX uses Amazon Web Services (AWS) for cloud-based access to its entire 100-petabyte imagery library. With the support of AWS, the GBDX for Sustainability Challenge taps into the potential of that vast digital library to support the United Nations’ Sustainable Development Goals. Extracting meaningful information from satellite imagery at scale is only possible because of the AWS Cloud. We caught up with some of the Challenge finalists to discuss their work and how the cloud is enabling them to innovate faster and achieve greater results. Please tell us about your project. What are the problems you are looking to solve and how do you plan to use technology to solve them? Duke University & World Resources Institute: Energy is the heavyweight contributor to climate change, accounting for around 80% of greenhouse gas emissions. Meanwhile, one in five people around the world still lacks access to modern electricity. When it comes to access to affordable, reliable, sustainable, and modern energy for all (UN Sustainable Development Goal 7), humanity faces a daunting challenge. The path forward would be clearer if decision makers had better data. In much of the world, power plants and grid lines are well documented, but that’s not true for many regions facing energy-access challenges. Even in resources like the World Resources Institute’s Global Power Plant Database, information about renewable energy infrastructure is lacking. Our team of researchers has demonstrated how using high-resolution satellite imagery from DigitalGlobe and the GBDX platform, coupled with state-of-the-art computer vision techniques, can be used to identify and track changes in key energy infrastructure. Our project targets the challenge of locating and assessing solar power generation. Global Green City Watch: The ability to experience nature is paramount to human well-being. Cities are on a mission to green their urban landscapes, especially with over half of the world’s population living in cities. Yet, local governments lack proper tooling to efficiently map and assess the amount, condition, and quality of parks, gardens, and other urban green space. As a result, it is difficult to formulate and execute policy goals with precision. Global Green City Watch unlocks valuable insights about the quality of urban green space by combining machine learning and image processing algorithms on high-resolution satellite imagery. We’re assessing the quality of urban green space from space. The tool, once fully developed, can help distill a city’s “park agenda,” saving cash-strapped municipalities time and money, and improving the quality of life for urban citizens. 20treeAI: The Cerrado in Brazil is one of world’s most diverse biomes. The growing demand for soy, cattle, and wood puts this unique biome under pressure. Creating data-driven intelligence and transparency about changes in land use helps governments, corporations, and NGOs to prevent and react to deforestation and loss of native vegetation. Combining machine learning with satellite imagery can help automatically recognize land-use changes with higher accuracy and more frequently. The 20treeAI team developed deep-learning models to detect early signs of deforestation and loss of native vegetation. We also create insights to grow more and use less. For example, we can identify cleared land that is currently abandoned. These areas can be re-used for agriculture or reforestation. UNICEF, Big Pixel Initiative, and Development Seed: There is an increasing number of children who don’t have access to education. It is estimated that by 2030, 60 million children won’t have access to primary education (UNICEF The Estate of the World’s Children 2016). Climate change and global conflicts are exacerbating this issue. By increasing the number of children who are on the move and difficult to reach for education. Without accurate data around schools and their infrastructure, organizations cannot use technology to improve educational opportunity. To solve this problem, we are exploring the potential of Convolutional Neural Network (CNN)-based algorithms, which take advantage of underlying patterns recognized from high-resolution satellite imagery, to map schools. The project goal is mapping the unmapped and making visible the invisible (https://www.projectconnect.world/). How does your project relate to the Sustainable Development Goals set forth by the United Nations? 20treeAI: Our project aims to help protect the Cerrado. We want to contribute to three Sustainable Development Goals. The first is Life on land. Forests are home to 80% of the world’s terrestrial biodiversity. The biodiversity of the Cerrado is exceptional, with over 1,600 species of mammals, birds and reptiles. The second is climate action. Forests are the lungs of our planet and slow down climate change. The Cerrado locks up an enormous store of carbon. The third is no poverty. 1.6 billion people rely on forests, including food, fresh water and shelter. In the Cerrado, its biodiversity resources underpin the livelihoods of millions. What are the biggest outcomes from your project? Global Green City Watch: Global Green City Watch has two big outcomes. 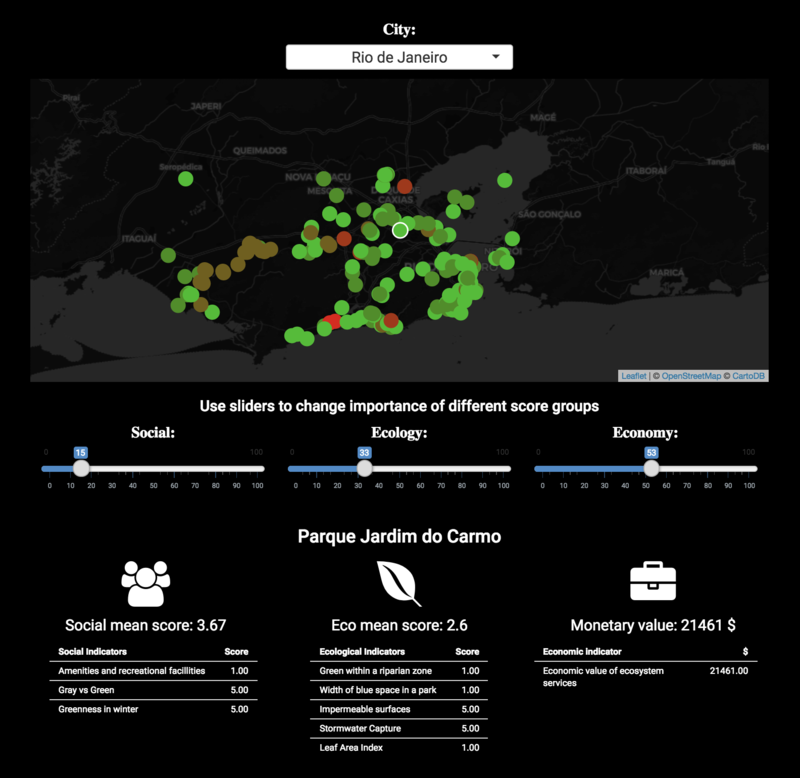 First, the preliminary production of the scalable and comprehensive Urban Green Classification Index, which provides the basis on which the tool has been built. The key performance indicators, scoring mechanisms, and the rationales at their foundation, can be accessed by anyone through our website. The second outcome is a dashboard to show the results. This dashboard makes insights actionable, but we want the back-end to be accessible as well. That is why, for the GBDX for Sustainability Challenge, we’ve delivered a streamlined, open-source Python tool package alongside a flat datafile so that technical as well as non-technical audiences can use our results and replicate our methodology. Notebook versions of our project are published on the GBDX platform for easy access to our toolbox, but for more advanced users our GitHub repository allows access to the source code of our tools and our dashboard. UNICEF, Big Pixel Initiative, Development Seed: We believe that mapping every school in the world is an important part of our global effort to provide fair opportunities to every child. Having this base layer of information will allow us to understand what are the connectivity and infrastructure gaps that we need to address in order to improve children’s access to information and education. It also allows us to explore a range of other applications like measuring vulnerabilities and improving our emergency response and resilience against natural disasters and crises. It’s simple enough to describe and broad enough to tackle. This allows us to bring in different partners from different sectors. We are working with the government of Colombia to explore how we can use this for education in emergencies. What are the future goals of your work? What are the next steps to further the work? Power plant identification and monitoring. Track the deployment of renewables at all scales, small and large, and characterize key plant properties (such as capacity), and for fossil plants, emissions remediation technologies, and water consumption. Building energy consumption. Use building attributes to estimate energy consumption and identify opportunities for increasing energy efficiency globally. Pathways to electrification. Determine economically and environmentally optimal pathways to electrification in developing countries (i.e. grid extension, microgrid development, or off-grid generation) by identifying transmission line locations and estimating village electricity access. What key things do you need to be able to meet your future goals (e.g., new datasets, better dataset access, access to more imagery or more processing)? 20treeAI: To make sure the insights are updated frequently and to push innovation further, we need access to: high-quality, ground-truth data to improve algorithms; frequent imagery to update insights; and processing power to train new algorithms and to process new incoming satellite imagery. Duke University and World Resources Institute: The most critical resource for meeting these future goals is access to recent, high-resolution imagery for many locations around the world. Graphics Processing Unit (GPU) access is also another key to meeting future goals and determines how quickly the processing can be executed. Additionally, projects like this that are targeted at addressing societal questions around sustainability require support for the time of the skilled personnel executing this work. How has having access to 100PB of imagery and scalable processing via GBDX enabled you to approach this work differently? Global Green City Watch: High-quality green space serves as an indispensable asset to local economies and public health. As urban populations continue to surge, green space is becoming more important than ever before. The value of green space remains underestimated due to a lack of quality information about what quality green space means and how existing spaces within the city score on important parameters. Until now, it has remained expensive and time consuming to assess existing green spaces and understand how to improve them, leaving progress out of reach. Access to the GBDX Platform with high resolution satellite imagery and the versatility of a cloud-based analysis platform enabled Global Green City Watch to achieve its goals in an innovative way. With access to the data, we developed a synergy of machine learning and image processing algorithms on high-resolution satellite imagery, measuring the size and shape of urban green space while also identifying objects hidden inside these spaces. Objects, such as playgrounds, benches, and riparian vegetation, are essential for quality assessments. This approach democratizes this knowledge, especially with the Urban Green Classification Index being open-sourced. The result will empower local governments to build multi-functional and effective urban green spaces across the globe. UNICEF, Big Pixel Initiative, Development Seed: Having high resolution imagery is critical for the project. Publicly available, non-high resolution satellite imagery doesn’t provide the sufficient level of detail required to identify individual buildings and characteristics surrounding them. In addition, GBDX has enabled us to process these large amounts of data in a scalable manner and it also provides the ability to easily replicate the work in new regions. Join us for a unique Earth & Space on AWS experience Tuesday, June 19, 2018 featuring DigitalGlobe. Hear from customers and thought leaders who are unearthing new discoveries through cloud technology and public-private partnerships. Choose from nine breakout sessions highlighting innovations with geospatial data, satellite technology, artificial intelligence, machine learning, high-performance computing, and much more. Register today.